There are many animals in the desert that have adapted in various ways and degrees to the desert environment. Some, like the jackrabbit, can live far out into the desert where there are no springs, and liquid water only exists for a few hours after a rain. Then there is the white desert snail whose survival seems so improbable, yet it exists all over the Desert Southwest. One of the most important adaptations that all desert animals have in common is their use and understanding of the thermal environment. Desert bighorn sheep are no exception to this, indeed they have mastered it. In this modern day and age we have many fabulous tools to help us learn and understand this relationship that the desert bighorn sheep have with the thermal environment. These include motion detecting cameras, radio collers, and modern optics. One tool that is often overlooked is the temperature gun. These thermometers with a laser sighting system are a marvelous tool to explore and learn about the importance’s of the thermal environment of the desert. By using one of these laser sighted thermometers one will find that the thermal environment is connected to all things. This includes the color of the earth, and the shadows, and reflectivity of rocks and plants. Knowing these kind of things can help us to understand and appreciate in depth the thoughts and adaptations of the desert bighorn sheep. For instance most other bighorn species experience hard times and die offs in the cold winter months. This is not necessarily true for the desert bighorn sheep. In the low desert the winters are mild and snow free. This is a time when survival is easier and desert bighorn travel widely across their habitat. On the other hand the summer time is often a time of hardship and death, due to the extremely high temperatures and the lack of water. Other herds of desert bighorn sheep that live further north and at higher altitudes experience a different thermal environment where both midwinter and midsummer are times of thermal stress on the sheep. So to understand a herd or their habitat one must understand thermal environment and how it’s connected to all the other environmental components such as the plants and the behavior of predators. If you watch desert bighorn sheep in the summer you will find that by necessity they understand and utilize shade much more than other species of Bighorn. Sometimes in their thermal environment the ground temperature can exceed 200°F and only a few feet away in the permanent shade of a boulder the ground temperature it will be 75°. Their ability to adjust their behavior to these types of temperature extremes can mean the difference between life and death. While the desert bighorn sheep skin is thermally protected by its fur, it is still too hot to lay down on the ground at 200°F for any length of time. To do this would quickly elevate their body temperatures and use up precious body moisture, so on days like this they must find shade or remain standing. In some Desert Bighorn Sheep habitats, shade is abundant in the form of rock formations and plant life. There are some portions of desert bighorn sheep habitat where the use is limited, due to the scarcity of shade. In this situation small pieces of permanent shade can be a critical and strategic components of their habitat. The concept here is that the effects of shade should be viewed as cumulative and in some ways a source of water. A common behavior for desert bighorn sheep is to drink their fill of water and then go and lay down in the nearest shady spot for an hour or two of rest and rehydration. No doubt this behavior influences what water sources they prefer as well as which direction they will go after drinking water. This is the kind of knowledge ancient hunters knew and utilized, and in some places the petroglyphs they left illustrate the depth of their understanding of the bighorn sheep and their environment. Of course not every day is so hot that the desert bighorn sheep need to use shade. In the winter they will seek warmth on the south side of a hill or on dark colored rocks that has absorb the radiant energy of the sun more efficiently. It is also important to understand that not all shade equal. Sometimes in the summer a steep north slope has a cool enough ground temperature for the sheep to bed down on. Then there are situations where the deep shade on the north side of a cliff or small cave may have a view that is blocked by brush or boulders such that it is rarely used. With this understanding we can see the possibilities of artificial shade as a wildlife management tool for desert bighorn sheep. This can be done for a variety of reasons and in a variety of ways. The most obvious reason would be to increase the value of a water source that did not have a sufficient shade resource associated with it. This could be done in a straightforward manner such as putting up a few posts to support a roof, or something with a more aesthetically pleasing outcome such as fake rocks or trees. Some may consider this frivolous or perhaps futile rather than real mitigation. With some experimentation and observation this technology of artificial shade could affect such things as lamb survival rates and herd/meta-population distribution. Another ability that desert bighorn sheep have is the ability to walk across the desert landscape when the ground temperatures are extremely high. This they can do where other animals cannot or will not. This is because their hooves give them a considerable amount of insulation from the ground, protecting them from the heat and the cold. Oftentimes their behavior in regards to the thermal topography of desert is literally etched in the landscape by their hooves, in the form of game trails and bedding sites. It is not that unusual to find game trails to bedding sites that have as their primary resource deep shade. It is always important to explore and understand a site like this, because it is a rich source of information about herd behavior and distribution. It is every bit as important as understanding the attributes of the game trail going to a water source. Another crucial part of understanding the deserts thermal environment and its relationship to the behavior of desert bighorn sheep is the concept of a “thermal event”. The most predictable ones are the changing of the seasons and the cycle of night and day. But there are other kinds of thermal events that affect survival and distribution of desert bighorn sheep. A wind event can be viewed as a thermal event whether it is a cold wind or hot. 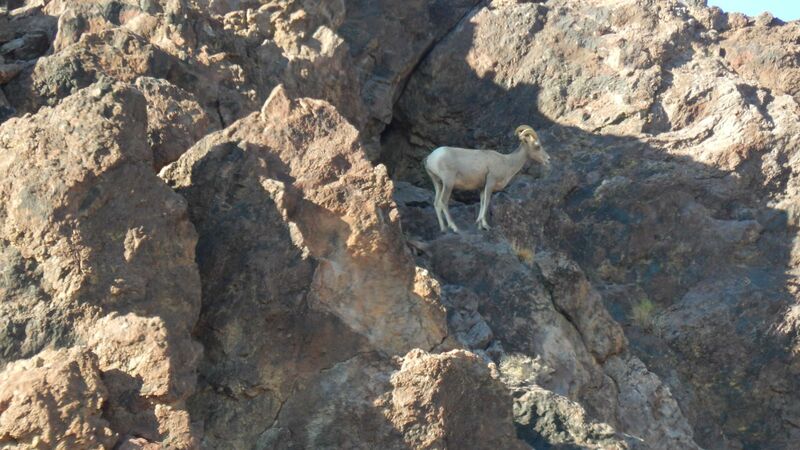 The desert bighorn sheep will adjust their behavior and placement in the thermal environment accordingly. Cloud cover can also make for some very interesting thermal events. In the winter time a good solid cloud cover will hold in the Earth’s heat and elevate nighttime temperatures. This can have a considerable effect on lamb survival rates for some herds. In the summer time a good solid cloud cover often comes with high humidity making escape from the heat difficult even when there is shade available. Perhaps one of the most interesting and complex thermal events comes in the form of rain, which tends to flatten the thermal landscape. That is, there is less temperature difference in the landscape after a rain regardless of the lands orientation to the sun and wind. It is important to have a basic understand of this mechanism, that causes the flattening of the thermal topography. Because it affects the behavior of desert bighorn sheep in many ways. In the winter time on a hill or mountain the north slope ground temperature may be near or at freezing and on the south side perhaps 50 or 60°F. Then along comes a rain with a water temperature of let’s say 40°. This will tend to warm the north slope and cool the south slope all at the same time. This is due to water’s high thermal density, that is to say a small amount of water can change the temperature of a lot of Earth. Now in the summertime things can get very dramatic with thunderstorms. Here we want to get past the mesmerizing flash of lightning emotional impact of the thunder, and see deeper into this process. One can view these storms as immense and complex transformation of thermal energy. A fascinating place to experience this dramatic process is on one of the desert’s dark black lava flows where the ground has soaked up the radiant energy of the sun very efficiently, driving ground temperatures up extremely high. When the rain first impacts these rocks there seems to be a hissing or splattering sound, and for a moment or two, these dark black rock formations are covered with a blanket of steam. Then gusts of wind run hot and cold with updrafts and downdraft’s shifting in various directions. And something on the order of a square mile of rock drops more than 100°F in a minute or two! Then with the storm passing there are insects flying around that didn’t seem to be there just minutes ago, and lizards and other wildlife seems to appear from nowhere. All the while this thermal energy is flowing into the landscape and is transformed in many ways, and thus it affects all living things. So it is with this knowledge, like the ancient people had and the desert bighorn sheep have, you can experience and feel the thermal components of the desert environment, and know, the way of things.